Aquarian Modern Vintage Medium Tom Heads 12 in. 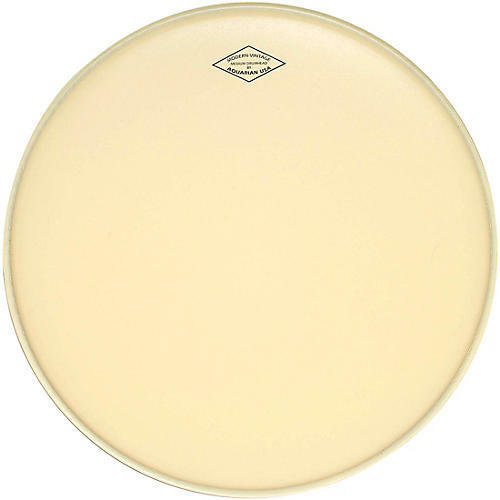 The Modern Vintage single ply, 10 mil, Medium weight drumhead, features a special coating that has the look, the feel and the warm sound of a calfskin head. The coating is slightly thicker and helps to slow the vibration of the head resulting in a lower, warmer tone with a softer feel and a classic vintage look. These full range tom and snare drumheads and are suitable for any musical setting where warm tone and full resonance are welcome. These medium weight heads are perfect for either Batter and Resonant heads. Modern Vintage heads make the drums look as good as they sound.